Since I’ve been doing a few hikes recently, I was expecting that trekking Mt. 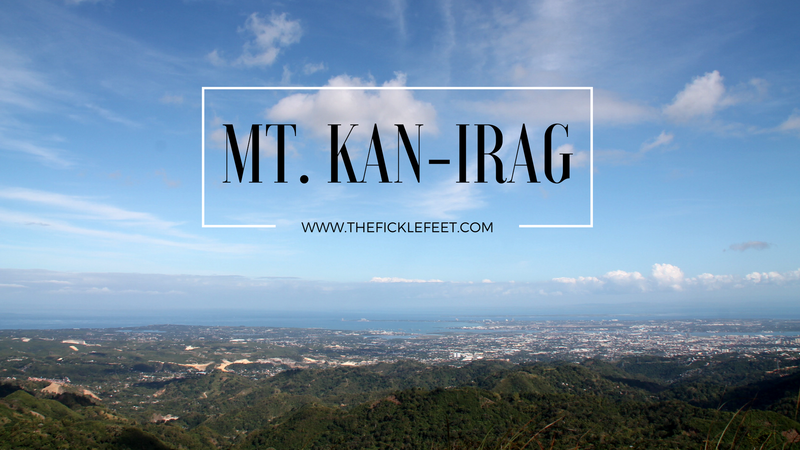 Kan-irag is as easy like my previous hikes. But I was wrong. It was longer, tougher, and definitely more challenging. Mt. Kain-rag also known as Sirao Peak is a 2,362 ft / 720 m mountain peak located in Cebu City. Many hikers go here for their preparation for their major climbs. During this day trek I was with my friends and our 65 years old guide Ta Ma. She started climbing at the age of 50 and since then she has been able to hike major mountains in the Philippines. Hiking with her was fun, motivating and inspiring. She guides us for free, and I’m looking forward to do more hikes with her. From Sunny Hills, Talamban we just walk until we reach Sitio Baogo. But you have an option to ride a habal-habal for Php25.00. Started the trek via Baogo Trail. The river trek to Kabang falls was quite fun and challenging at the same time because scramble boulders are everywhere. Since I like to hop over those big rocks I was definitely having fun during this phase of the trek. Just a few reminder that it was a good weather we had during this trek so we did not encounter strong current of water. Also, be careful because these rocks can also cause huge injuries. We had lunch at Kabang Falls. Facing Kabang Falls, on the right side is the common route for trekkers go to Mt. Kan-irag, but we tried the left one where most of the hikers were going down. We also got lost for a while, but we were able to get to the right track afterwards. We passed by a smaller waterfall and took another rest here. As we continue our journey. Our bottles of water were almost empty. But on the way, there’s a water source called “Tubod”. I honestly quite afraid to try the water, but the locals said it was clean. Thirsty and we have no other choice, we got some water here. After a few hours we come to pass a civilization again. And I thought we were really close, but not close enough. We proceed and pass the field of cogon grasses. We reached the peak at almost 4:30pm and it was fulfilling! Make sure to travel light. Wear the proper climbing attire and shoes. Hello, I don’t have any contact for Mt. Kan-irag since I went there with some friends who already knew about the route. For your itinerary, it targeted a lot of destination which makes it not too flexible, however it can be done. If you’re going to try the whale shark in Oslob, it will be only available during 6:00am-12nn. There’s a lot more interesting things to do in the south like Pescador island in Moalboal, and see the thousands of sardines. You might want to ditch this one. If you can’t find a guide, you can go immediately on the top via habal-habal. Then after that, you can go ahead to Malapascua/Bantayan so you can spend more time in the island. PS. You might want to consider Camotes Islands. Thank you for your inputs. Very helpful!